SPOILER ALERT: This film is now in theaters, and I highly encourage you to view it for yourself. You may want to jump down to the end of this review for a note on content first, but if you want to watch the film without knowing too much about the plot, you’ll want to skip the review until you’ve seen the film. What I can tell you is that, despite what you may have heard, the American flag makes many appearances - including on the moon. As the previews were beginning to run before the 8:00 showing of First Man that my wife and I attended, I had a bit of a problem. I had to go. You know…I had to go! I gave a nervous glance at the nearly-full large Cherry Coke in my cupholder and began to weigh my options. Where was the nearest bathroom? How much time before the movie starts? I sat in the rapidly-building tension for what seemed like hours, until I finally gave into what my body was telling me and got up from my seat. I made it back well before the movie started. Why begin my review with that little anecdote? Well, in an odd way, I think it may have just been a pretty good preparation for the experience of this film. Hear me out, I mean that as a compliment. In First Man, Damien Chazelle has shown us once again that he is a master of the technical craft of filmmaking. The man who won Best Director for his work on La La Land (and who made an even better film with Whiplash) has given us a creation that puts us authentically and viscerally as close as possible to being in the seat next to the great Neil Armstrong (played here by Ryan Gosling) as he throttled towards the moon. This is a tense film at times; at others it is extremely tender. It tells a story with which most people will be familiar before they enter the theater. At the same time, it unearths many parts of Neil Armstrong’s story that were either new to me or I simply hadn’t really considered much. While we’re on the topic of historical inacuracies, you may have heard about that absolutely ludricous controversy about how this film portrays the American flag. Now that I have seen the film (which is - maddeningly - more than about 99% of the people who started the controversy can say), I can assure you that the flag makes many appearances, including a powerful shot of the flag planted on the lunar surface next to the lunar module. While the physical act of Neil Armstrong planting the flag is never shown, the fact that this was an American accomplishment is made abundantly clear. That this is even a discussion makes me nearly pop an artery just thinking about it. So rather than give it any more space in this post, I’ll instead direct you to Alissa Wilkinson’s fantastic piece on the subject for Vox. This film’s key accomplishments are in its technical components, and I would not be surprised to see it win multiple tech Oscars at this year’s ceremony. The ones that stand out most are probably the film’s sound design and sound editing. Both components work together to put you in the midst of the tension whenever rockets are taking off. Then, they pull back to showcase the silence of space. In fact, after the film, my wife commented that it was one of the quietest movies she’d seen. I thought A Quiet Place would have a firm hold on the top spot for the sound categories, but now I’m not so sure. Then there’s the film’s incredible cinematography by previous Chazelle collaborator, Linus Sandgren. When we’re on Earth, there’s a grainy quality to the film. But once the action reaches the lunar surface, everything is crystal clear. It’s a subtle choice, but I thought it was fantastic. There are also many powerful shots, including one that will tug on your heartstrings once Armstrong is on the moon. The film also does an incredible job of attempting to replicate the act of flying up into the stratosphere powered by massive amounts of rocket fuel. The camera shakes violently until we begin to feel the tension in our seats. It’s a visceral experience. But the storytelling components are not to be trifled with either. The acting performances - especially from Gosling and Claire Foy (who plays Janet Armstrong) - are stellar. There is a tragedy from earlier in their lives that is carried through the entire film’s narrative that gives it an emotional twinge. It brings us to the film’s quiet ending. While I’m not 100% that the ending quite fits or is completely earned, it is certainly ambitious. I look forward to my next viewing to revisit how I feel about it. More than anything else, I think my favorite aspect of the film was the music. Composer Justin Hurwitz creates some astounding moments through his use of classical music cues (a la 2001: A Space Odyssey) as well as more modern components. However, he also knows when to pull the score back and let the aforementioned silence rule the day. The music is moving and powerful, and this is probably my favorite score of the year so far. This film is obviously a biopic, a genre that has become stale to some. Personally, I enjoy biopics. However, I acknowledge that many are visually and thematically safe. 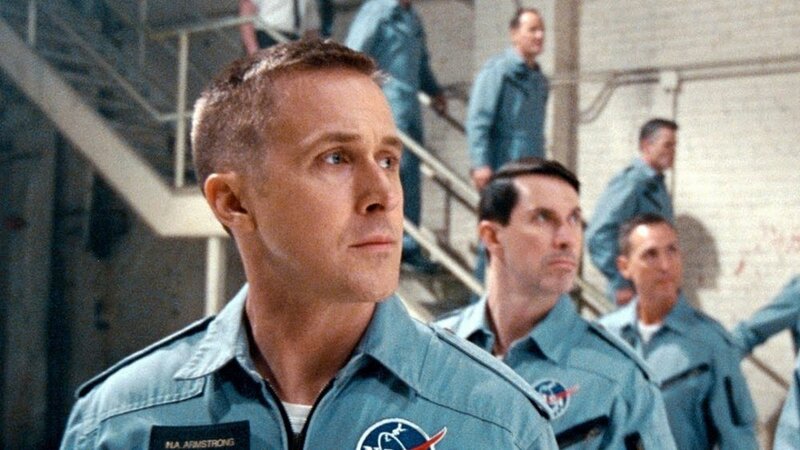 There’s a bit of a rote blueprint for a successful biopic, but First Man is anything but rote. I appreciated how the film lingered on moments you may not expect it to. Sure, there’s the obligatory “stepping on the moon” sequence. But there are also many other seemingly smaller moments which the film handles with just as much care. Overall, I think this is clearly one of the year’s best films, and it is another in the growing line of fine films from Chazelle. While I don’t think it quite reaches the lofty heights of his earlier work, it is a wonderful film in its own right. It is one that demands to be seen and experienced. Note on content: The film is rated PG-13 and should be appropriate for most ages. There are some thrilling sequences that may be frightening for younger children. And there is moderate language. Overall, it is a powerful film that also contains an educational component thanks to its historical narrative.